4 - What Wondrous Love Is This? 7 - Oh! Great Is Our God! Customer Reviews For "Mars Hill Music Worship Sampler"
As a fan of Mark Driscoll's gospel-centred, hard-hitting, to-the-point preaching, I thought that this worship sampler -compiled by various artists of Driscoll's church- was a fitting reflection of what Mars Hill Church has been renowned for: showing the relevance of Christ in a post-modern, post-faith culture. While the playlist of songs may contrast sharply in their genres if listened to from start to end -traditional hymn, followed by alternative rock- each song remains cross-centred and Christ-centred. 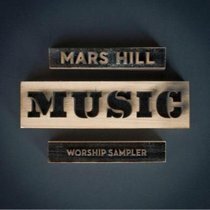 If you have been accustomed to a particular genre of Christian music, this sampler CD may cause you to question your preconceived ideas of what constitutes 'Christian music'. As Driscoll has been known to teach, there are things in our culture that can be redeemed (such as the musical genre of alternative Indie rock, see track 14 by Kenosis), and used for the glorification of Jesus Christ.